With the aging process, the skin begins to lose its elasticity and sag. For many, this sagging is particularly pronounced in the neck area where extra folds and fat deposits may develop and lead to the appearance of a “double chin.” The neck lift is a cosmetic surgery procedure which improves the jowls, loose skin of the neck, and fat deposits beneath the chin to restore a more youthful and refreshed appearance. During surgery, the underlying muscles are tightened, and excess fat and skin are removed. 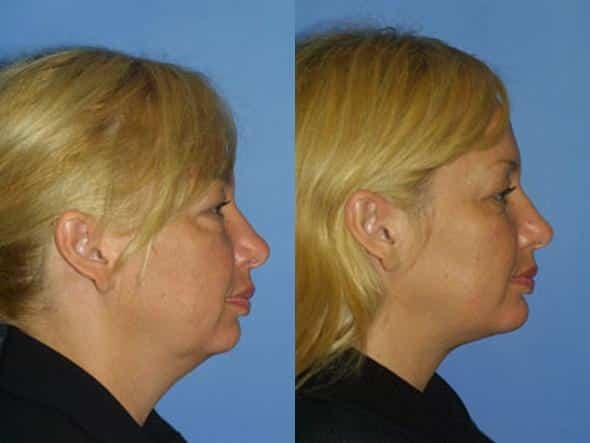 Though less invasive than the facelift, the neck lift nevertheless provides dramatic results. Candidates for neck lift surgery are generally healthy, do not smoke, and have realistic expectations for improvement. Individuals who are experiencing loose skin and fat in the chin, jaw or neck area, often due to age or weight loss, can benefit from this procedure. In some cases, liposuction alone to remove excess fat may be sufficient. Dr. Miller and Dr. Steinbrech perform the neck lift on an outpatient basis at the JCAHO Accredited office-based surgery facility at Gotham Plastic Surgery of New York City. General anesthesia or IV sedation may be used. The incision for the neck lift is typically located around the ear lobe and behind the ear, ending in the lower scalp. Through this incision, the muscles are tightened, excess skin and fat are removed, and the incisions are then closed. Patients can expect some swelling, numbness and bruising during their recovery. Bandages are typically applied after surgery. In some cases, drainage tubes may be applied at the incision sites to collect excess fluids and these are usually removed the following day. Stitches are removed within one week. Most patients find that they are well enough to return to work after two weeks.